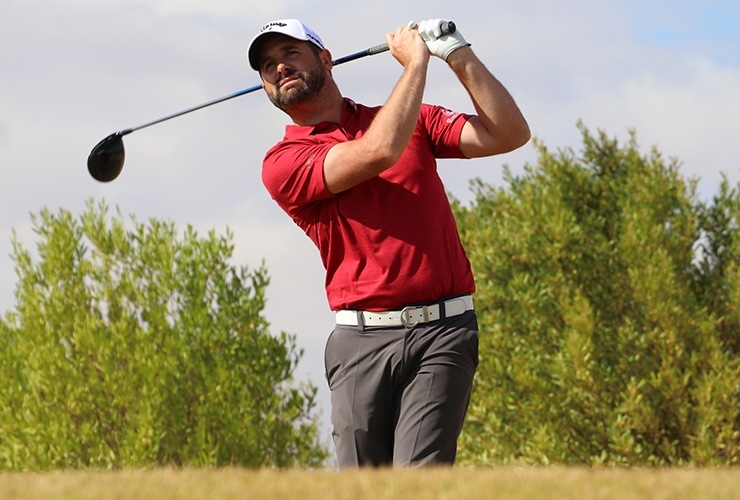 The 32-year-old Englishman completed an emphatic wire-to-wire victory at the MENA Tour’s season-opening Journey to Jordan-1 championship in Aqaba on Monday, a first win since capturing his maiden pro title at the Challenge Tour’s Fred Olsen Challenge de España in 2011. A second successive six-under 66 at Ayla Golf Club saw the Southport pro tally an impressive -19, 197 aggregate for 54-holes, a mammoth eight-strokes clear of Swedish 23-year-old Erik Jonasson. That’s a MENA Tour record for the largest winning margin in one of the circuit’s three-round events, eclipsing by one the previous mark set by Frenchman Lionel Weber at the 2017 Mountain Creek Open by Golf Citizen in Thailand. Jonasson’s consolation for solo second (-11, 205) was a spot in the Challenge Tour’s Challenge de Espana in the first week of May. The invite was intended for the winner but Baldwin already has Challenge Tour status, his solace after finishing 164th (with €141,569) in last season’s Race to Dubai before dipping out at the second stage of European Tour Q-School, the brutal backstop that regularly fails to break the fall of those who drop out of the top tier. He revealed more after the trophy presentation at Ayla G.C. which will host two more ‘Journey to Jordan’ events this season, including the $100,000 Tour Championship in late November. “Last year was a bit of a struggle and I took a long break of two months and did not touch my clubs. So, it was good to come out and play the kind of golf I think I can play,” said Baldwin. 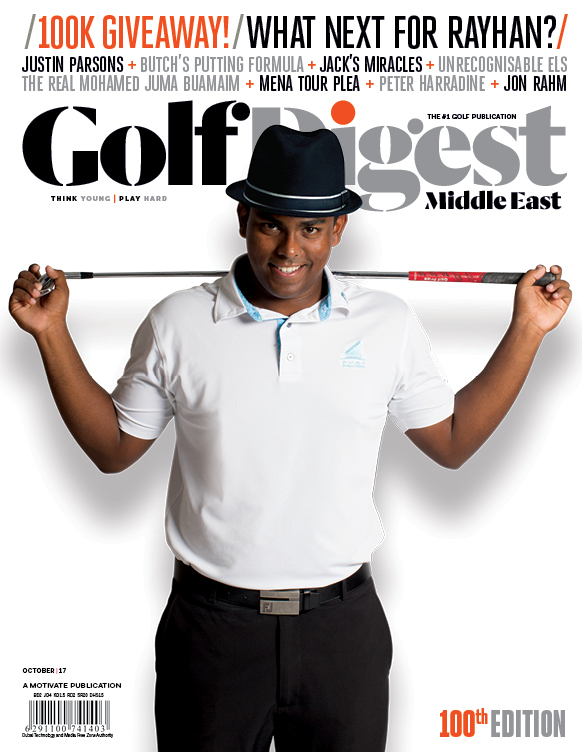 He gave a hint of that class earlier last week by earning his MENA Tour card in style, claiming medallist honours in the second of two Q-Schools also held at Ayla Golf Club. In six rounds over eight days at the Greg Norman designed layout, Baldwin scored no worse than a two-under 70, scribbled down just five bogeys (three this week) and finished a combined 31-under-par with a stroke average of 66.83. Jonasson never had a chance to catch Baldwin but wasn’t grumbling having only turned professional late last year. “It feels amazing. I made a birdie on the first hole, and that just got me going. I am beyond happy to make such a strong start to the season,” said the Stockholm rookie. Scotland’s Conor O’Neil (70) and Belgian Christopher Mivis (70) were tied for third place at 10-under par 206. Low amateur Curtis Knipes (right) with Chris White, Director of Operations at Ayla Oasis. 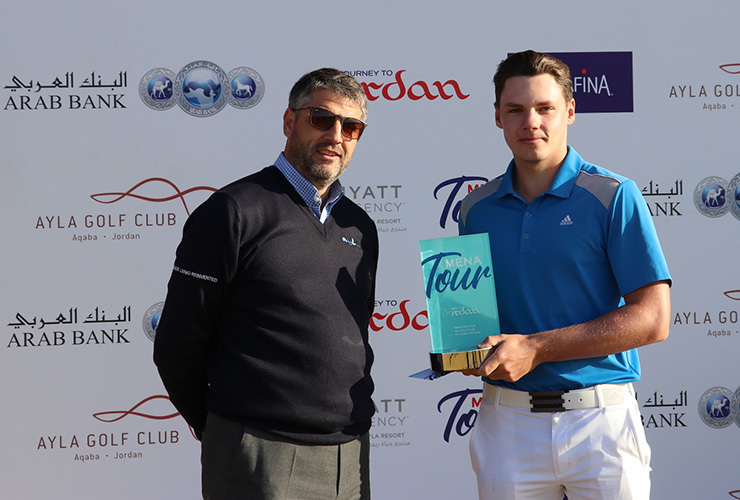 England’s Curtis Knipes (71) capped off a fantastic two weeks in Jordan by finishing as the leading amateur, a week after he secured a full card through the Q-School. Countryman Jack Floydd slipped down with a four-over 76 to finish second, three shots behind Knipes. Dubai-based Josh Hill finished third among the amateurs with an even-par round of 72 for a -2 total and a share of 32ns, while his good friend Arjun Gupta, also 14, shot a bogey-free six-under par 66, matching the best round of the final day, to finish level par 216 in a tied for 40th. Toby Bishop was 60th on +7 following a closing 76. Al Zorah Golf Club in Ajman will host the second leg of the MENA Tour’s ‘Spring Swing’, the Troon Series-Al Zorah Open, from Feb.17-21. Cheyenne Woods will chase her second Ladies European Tour (LET) title at the new-look Omega Dubai Moonlight Classic early next month.